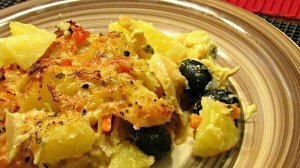 I decided to start with a recipe of codfish as it’s one of the most famous ingredients in Portugal – and this is my version of codfish in cream with baked potatoes. We can even say that codfish it’s one of the most traditional dishes and it’s part of our daily diet. Although it can be found fresh, the most used is the dried, salted codfish which we can find in any supermarket. And you can also find it here in Malta (although it’s not as common) either in some of the main supermarket chains or at the Sunday market in Marsaxlokk. The codfish is bought dried and salted but we need to re-hydrate it and remove the salt before cooking it. The best way to do it is by putting the pieces of codfish in a large bowl and cover it with water. Then leave it to soak between 24 and 48 hours (depends on your taste). During this time, you need to change the water several times to help remove the salt. When ready, you can either cook it or freeze it. Cook the cod fish for 5 min in a pan with enough water to cover the fish. Turn off the heat and keep it in the cooking water for another 5 min. Remove and set aside the water. Prepare a stew with chopped onion, chopped garlic, bay leaf and drizzle with olive oil. When cold, remove the bones and skin from the cod and shred it. Add the shredded cod to the onion. Mix well and sprinkle with nutmeg. Add a little pepper and transfer to a baking dish, greased with butter.